Το μέλλον των μέσων μαζικής μεταφοράς και συγκεκριμένα του μετρό, στον 21ο αιώνα, συζητήθηκε σε συνάντηση στελεχών των Transport for London (TfL), London First, Arup, WSP, thyssenkrupp και Weston Williamson πριν από λίγες ημέρες στο Λονδίνο. Λόγω της αύξησης του πληθυσμού των πόλεων και της αστικοποίησης, οι σταθμοί του μετρό είναι αντιμέτωποι με όλο και αυξανόμενη κίνηση και προβλήματα όσον αφορά στην αποδοτικότητά τους. Στο Λονδίνο ο πληθυσμός αυξάνεται με ρυθμό 1,5% ετησίως, φτάνοντας σχεδόν τα 8,6 εκατ. το 2015- οπότε θεωρείται απαραίτητη η αξιοποίηση νέων τεχνολογιών στις μαζικές μεταφορές. Το μετρό του Λονδίνου είναι το παλαιότερο μέσο υπόγειας μεταφοράς στον κόσμο, και δέχεται μεγάλη πίεση, καθώς οι επιβάτες έχουν αυξηθεί κατά 33% την τελευταία δεκαετία και περίπου 1,34 δισ. επιβάτες το χρησιμοποιούν ετησίως. Επίσης, κάποιοι σταθμοί εξελίσσονται σε πολυσύχναστα «spots» της πόλης, όπως για παράδειγμα το King's Cross και το Waterloo. Σύμφωνα με τον Κρις Γουίλιαμσον, συνιδρυτή της Weston Williamson + Partners, η αρχική ιδέα της κατασκευής γραμμών υπογείως ήταν επαναστατική στον καιρό της, ωστόσο πλέον απαιτούνται νέες εξελίξεις. Μια από τις τεχνολογίες που υπόσχονται πολλά φαίνεται να είναι το σύστημα MULTI της thyssenkrupp Elevator, που επιτρέπει ανελκυστήρες τύπου «Willy Wonka», όπως στο «Charlie and the Chocolate Factory»- με δυνατότητα κίνησης τόσο οριζόντια όσο και κάθετα. Η τεχνολογία αυτή «σπάει την παράδοση» όσον αφορά στη λειτουργία ανελκυστήρων, χρησιμοποιώντας ένα μαγνητικό σύστημα, και θεωρείται ότι θα αυξήσει τις δυνατότητες μεταφοράς επιβατών κατά 50%, λειτουργώντας σε έναν συνεχή κύκλο, με τις πόρτες να ανοίγουν ανά 15-30 δευτερόλεπτα. Όπως είπε ο Αντρέας Σίρενμπεκ, CEO της thyssenkrupp Elevator, το MULTI είχε αναπτυχθεί αρχικά για υψηλά κτήρια, ωστόσο τα χαρακτηριστικά του το καθιστούν ιδανικό για σταθμούς του μετρό, καθώς θα μικραίνει τον χρόνο προσέλευσης επιβατών στις αποβάθρες, επιτρέποντας ακόμη την περαιτέρω επέκταση των γραμμών χωρίς να απαιτείται ριζικός επανασχεδιασμός των σταθμών. A Canadian company has clinched a patent for a 12.4 mile-high "space elevator" that could launch astronauts and tourists into orbit. 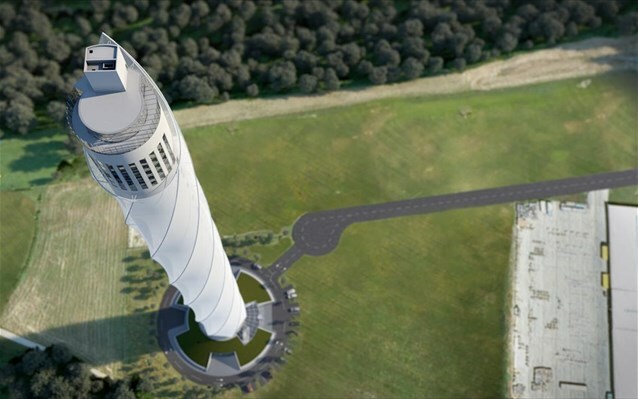 The free-standing tower would essentially be inflated, supported by a series of gas-pressurized cells, and serve as a docking platform for space planes that could launch cargo, tourists and satellites directly into lower orbit. Thoth Technology, the Ontario-based company behind the invention, told CNBC the elevator could transport 10 tons of cargo at approximately seven miles per hour, with passengers able to reach the top of the tower in about 60 minutes. Passengers could then board a space plane that could reach lower orbit without the need for costly a rocket launch. The elevator weighs about the same amount as a super crude tanker ship and is expected to cost about $5 billion to build. Thoth Technology said that once built, it will reduce the cost of reaching low Earth orbit by 30 percent compared to conventional rockets. Traditional rocket launches can cost upwards of $250 million, while cheaper commercial offerings like those offered by SpaceX — the commercial aerospace company founded by Elon Musk— lists the launch price of its Falcon 9 rocket at $61.2 million and it's Falcon Heavy model at $90 million. The inventor of the "space elevator" is Brendan Quine, an engineering professor at York University in Toronto and co-founder of Thoth Technology. He said the team behind the elevator worked on the concept for eight years before securing the U.S. patent in July. "Other inflated tower designs have been explored previously, but they typically use buttress designs or support cables that we believe [are] impractical," Quine told CNBC. Graham Warwick, a managing editor at Aviation Week, said that the aerospace industry had been looking for a cheaper way to launch goods and people for decades. "Single-stage-to-orbit from the ground has so far proved impossible and a true space elevator (stretching all the way into space) would be hideously expensive to construct if we knew how, so this is another way to do it," Warwick told CNBC. "Once built — if built, and if it works — this would seem to offer easier, more routine access to space. For spacecraft and for people." The next step for Thoth is to build a 0.9-mile-tall demonstration elevator, before building the full 12.4 mile-high tower. Even the demonstration tower would be the world's largest structure, Quine explained. Quine said that there was little to hold back development, since all of the technology required to build the elevator was readily available, adding that a demonstration elevator could be built within three years, and a full version within five years. Once built, Warwick said there might be further commercial opportunities, especially for tourism. "It could house hotels and restaurants that would provide the experience of being in space without the potential discomfort of zero gravity," he said. Quine didn't give any names, but said there has been "intense interest" in the space elevator's patent rights. LIFTEX 2016, organized by the U.K.’s Lift and Escalator Industry Association and planned for May 25-26 at ExCel London, again promises to be the place to be for industry professionals from around the world. There is plenty to see and do beyond the boundaries of the venue, as the dynamic capital of England has numerous exciting new-construction and renovation projects underway. Here are a few of them. Company representatives and lift professionals attending LIFTEX will surely be delighted to talk about their involvement in these and other projects in the works. U.K.-based John Gale is a second-generation veteran of the lift industry. He has worked as a photographer and contributor for EW since 1990, primarily covering meetings, congresses and trade shows. In 1999, he co-designed Moving People from Street to Platform, a book on the vertical-transportation equipment in the London Underground.